A shower stool is designed specifically to sit inside a shower or wet area. It makes it easier for you if you can't stand for a long time, or get very short of breath, as you can sit down when having a shower. You can also use the stool outside the shower to get dressed on. Shower stools come in many different shapes and sizes, designed to fit different people and different shower spaces. Some shower stools have adjustable legs, and some don't. Stools with adjustable legs tend to tilt forward, as they are slightly higher and angled at the back. Make sure you know what the options are. Also make sure you know your weight, and the weight limit of any stool you're considering. Don't use a plastic outdoor chair in your shower, as the plastic in these chairs can soften in the hot water, and the chair may give way under you. 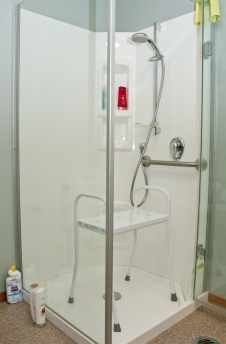 How do I use a shower stool? If your stool is adjustable, adjust it until it is the right height. Measure your lower leg from the back of your knee to your heel, then add 5 cm. Use the pop buttons on the front legs to change them to this height. Then adjust the back legs by the same number of spaces. The seat is often on a slight tilt, so make sure the higher side is at the back, and that your feet are on the floor when you sit on it. Place it with the highest (or angled) legs at the back. Place a non-slip mat under the front legs of the shower stool. Make sure the stool is stable before you use it. When sitting down or standing up from the stool, hold both armrests at the same time. This will stop the stool from tipping. If other people also use your shower, ask them to put the stool back in the same position after their shower, so it's always in the right place for you. Don't lean back on the shower stool. Don't use it if it is cracked, rusted, or unstable. If there are problems and Enable New Zealand paid for your stool, call 0800‑171‑995 to arrange for it to be checked. If you bought it yourself, get your supplier, or any of these equipment suppliers, to check it. Don't use it in the bath. If your shower is over the bath, there are other options, including a bath board. Talk to an occupational therapist about what will be best for you. How do I care for my shower stool? Wipe it down regularly, particularly underneath, to make it last longer. Check its condition at least once a month. Check for rust at welds and screw holes, make sure the rubber stoppers aren't worn, check the adjustment buttons are all locked into place. If you find any wear and tear, ring your occupational therapist or assessor to get it checked. Written by the South Canterbury DHB. Adapted by HealthInfo clinical advisers. Page created September 2017.